2014.08.06 - Aes Crypter Lite edition is available now: 1.2 (Build 346). 2011.07.12 - An updated version of Aes Crypter Lite edition is now available: 1.2 (Build 312). 2011.05.27 - New version of Aes Crypter Lite 1.2 (Build 296) is now available for download. 2011.04.19 - A renewed www.aescrypter.com site is up 'n' running starting from today. 2011.04.15 - The long wait is over. 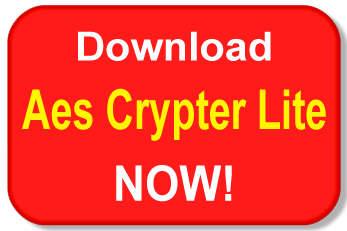 Aes Crypter Lite 2011 is now available for download. 2011.02.24 - An updated version of Aes Crypter Lite edition is forthcoming just around the corner. 2011.02.22 - Next Aes Crypter Professional edition will support Windows, Mac OS X and Linux OS.